Well hello everyone! How are you on this fine day?? I'm doing well. Feel like I've been slacking on the blog now that I cut back to posting every three days, but sadly it had to be done for a couple of reasons. First, my blog was becoming a nuisance and no longer fun. I typically paint my nails typically every three days so to paint, take pictures, edit, watermark, and write posts every two days was just getting crazy! I was taking off perfectly good manicures just to paint another one, which left me not fully able to enjoy my work. Secondly, I have gotten a bit busy with school, work, and life. While I love painting my nails and blogging, those are some things I cannot neglect for obvious reasons. Returning back to my every 3 day posting has been great, I've been able to save up some posts so I will hopefully not fall behind again. Sure the page views have gone down a tad, but oh well! I'm doing this for fun and really I never expected to hit 10,000 views, so to have done that, I'm truly honored. Enough of my babbling, onto my nails! 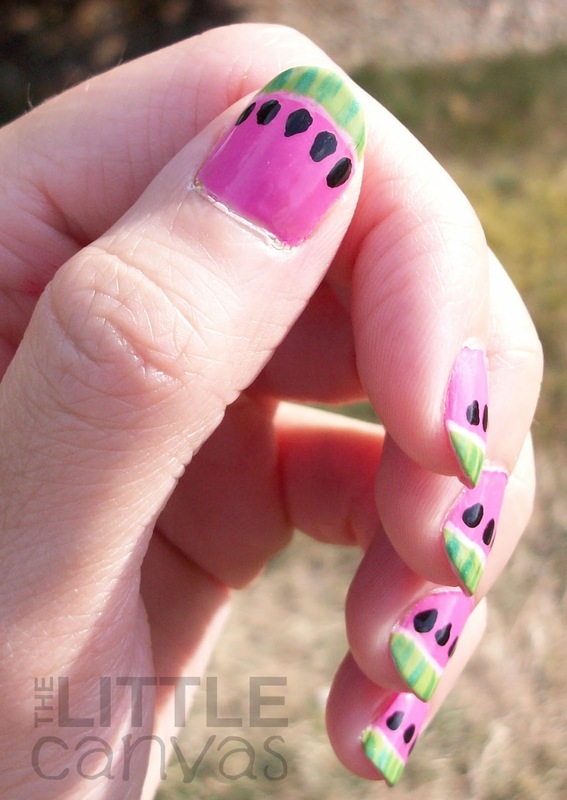 Today I bring you some watermelon nail art!!! I have seen people do watermelons all over the internet, be it on another blog, Pinterest, or just Google. 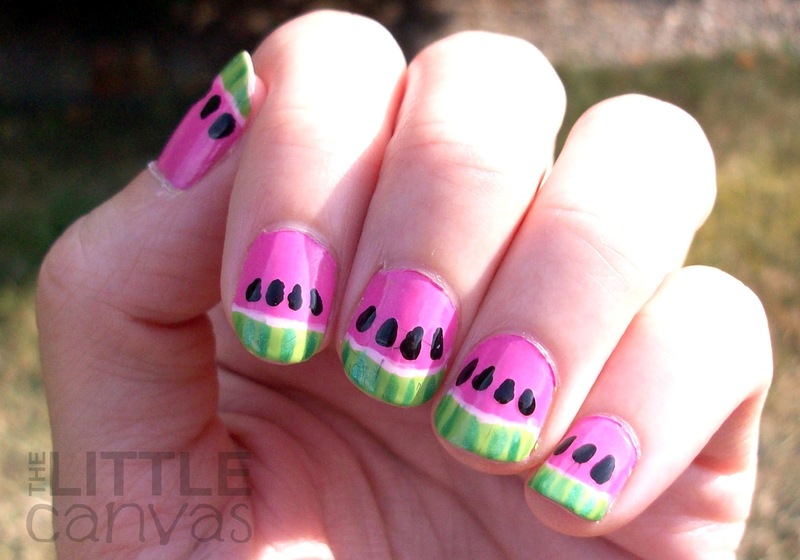 Back before I was a blogger and did strawberries on my nails, I saw this idea, but didn't have colors to actually do so! Once I entered this amazing blogging world, my stash has doubled and guess who has enough colors to do pretty much whatever she wants?! Yup, me! Here's how they came out!! Cute right? I got so many compliments on these nails that I may have to do them again before the summer is over!! To start, I painted on a base coat of Flamingo by Ulta. I'm new to Ulta polishes. I went into the store one day and hit their $2.00 a bottle nail polish sale and walked out with four bottles. An amazing deal considering the bottles are regularly priced at $6.00. I was very impressed with the formula! I had full coverage in two coats, but I really wanted the pink to pop so I used three for this manicure. Flamingo is a creme polish, and call me crazy, but I detected a really, really, really subtle shimmer. Emphasis on the really. I typically hate cremes, but am in love with this one. Once that was dried, I added on light pink French Tips with my striper and Queen Cupcake. When that was dried, with the striper again, I added Sassy (a lighter green polish) and left a little bit of the pink showing to resemble the rind. With the striper again, I went back and added some HD Nails (a darker green shimmer polish) to give the rind a real watermelon look. Before adding a top coat, I tooth picked on some seeds, which ended up being more difficult than usual for me. I think it was the shape of the seeds that threw me for a loop. I'm usually used to dabbing on circular things so it was just annoying. What do you think? 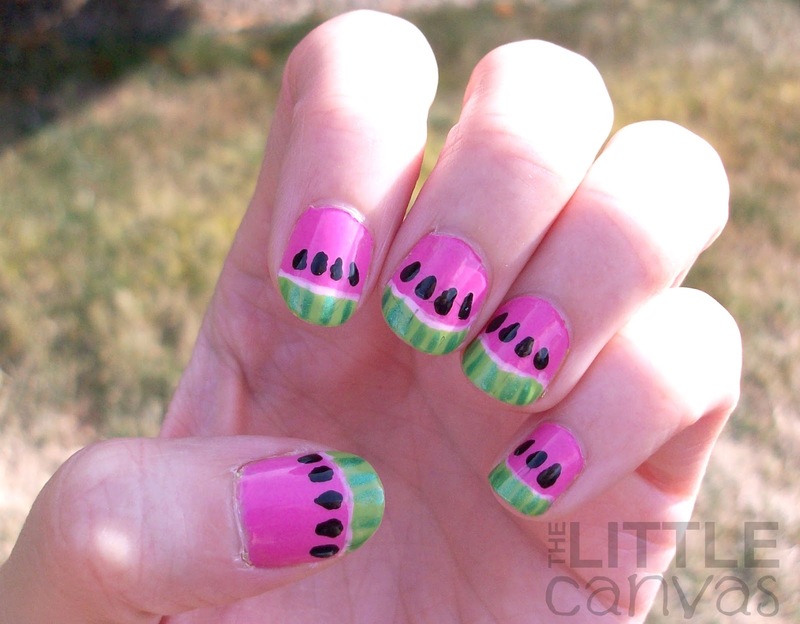 Do you like my watermelons or strawberry nails better? Do you like fruit themed nail art?? 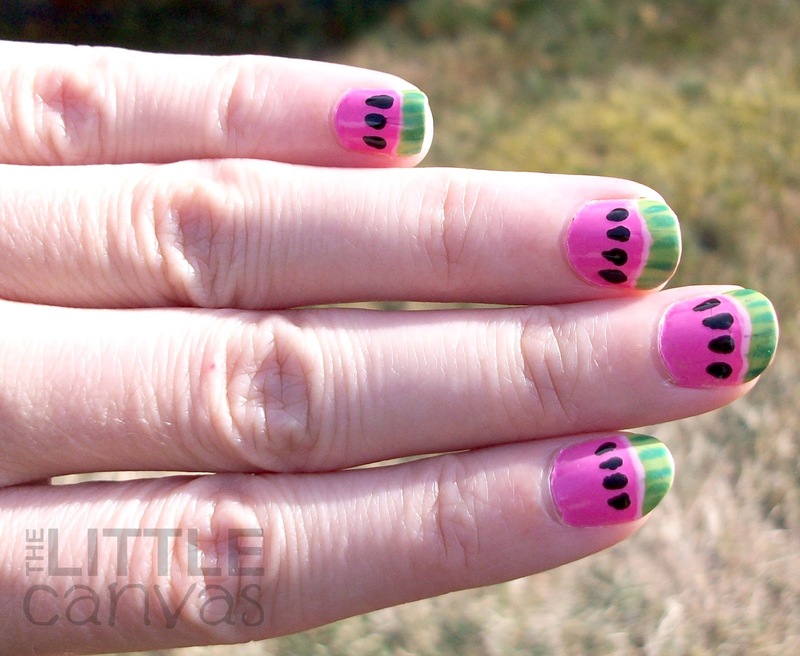 I found a fruit salad manicure that I'm dying to try so keep an eye out for that! In the end, I rate this manicure a 4 on the difficulty scale. I really think you should all try it!!! And if you do, I want to see! Send me a Tweet or post it to my Facebook. I love to see others nail art!!! These are so cute! I am obsessed with fruity nail art lol. 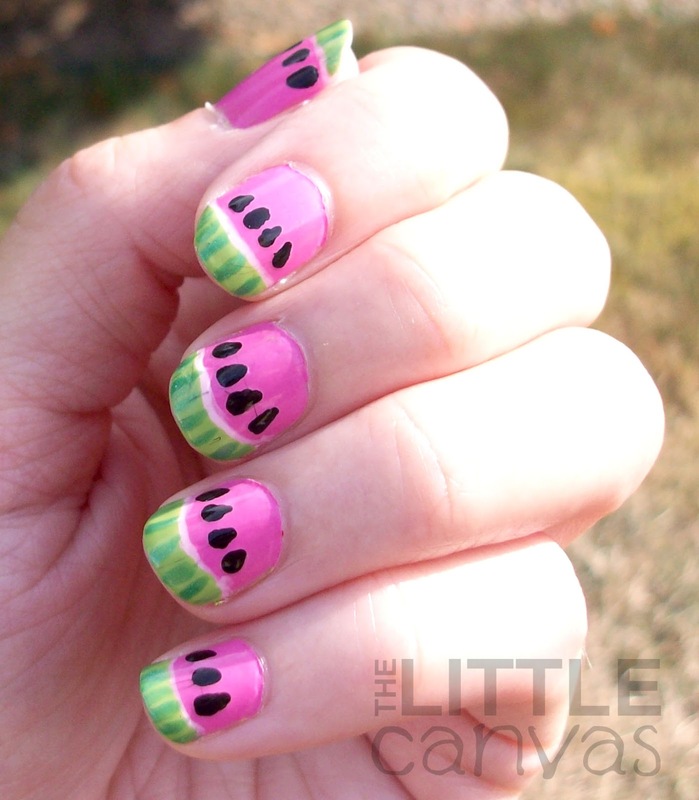 Even before I was into nail polish and whatnot, I did a watermelon manicure for the fun of it! Thank you!!! Do you have a picture of them?? If not you need to do another one :). CUTE! I've always wanted to try watermelons on my nails. They seem fairly simple. So cute, I love how they came out! How cute! I love the look - how about some kiwi next? thank you!!! i may try it! i found a cute fruit salad manicure on pinterest which included a kiwi!!! super cute! I have yet to try any of the fruit nails yet. thank you!! and you should do it! they aren't that hard and really worth it in the end!